Practiced for over 3,5oo years! All our fear comes from the darkness of our mind where there is only a shadowy vision. Learn how to remedy that. This 55 minutes will be well spent. You will never forget it. You will become stronger and be readier than ever before to build your business and career. To build a business, to build a powerful profession, we have to become fear free.Watch this replay of the Webinar. This 41 minutes will change your life forever. To build a business, to build a powerful profession, we have to become fear free. "I was gifted "Ancient Secrets of Success" about 5 years ago. I read it... re-read it... and it made complete sense to me, not only on an intellectual level but on a 'knowing' level. I began meditating to the principles, and what I noticed was an immediate release of stress. I realized, I was creating 100% of my stress and if I could create it, I could un-create it too and that goes not only for my circumstances but for my interpretation of what's going on and my response to it. So no matter what was going on around me I was okay, on the inside; and not only okay, but proactive in getting busy creating what I wanted. Focusing on what's wanted, instead of what's not wanted, is the simplest and most powerful life-changing practice ever! It's been an amazing journey of discovery and deliberate creation and while I'm still learning (and not successfully applying the principles 100% of the time) I'm getting better and better, and my results are proof! THANK YOU Tulshi Sen for this mind-opening work!" "The Ancient Secrets of Success, however, filled the missing piece for me. A piece that I've been searching for, for a long long time. It gave me "the how" in the process of taking command of your mind, and therefore your life. It de-mystifies ancient wisdom. This book is profound and yet written in a way that is so simple and so clear. Reading this book has already created a shift in my life. This is a must read for everybody, and a vital read for coaches and all those who work in fields that involve facilitating human potential. Thank you Tulshi Sen for offering your teachings on a global scale, the ripple effect will be magnanimous." "This book was recommended when I was expanding my business to the next level. It blew my mind away. It showed me exactly what was holding me back and gave me the confidence to move forward. The 4 Proclamations stop worry when it starts and give you that quiet feeling of knowing you can succeed. What a relief, I actually feel good about myself and have the clarity and drive to expand my business. 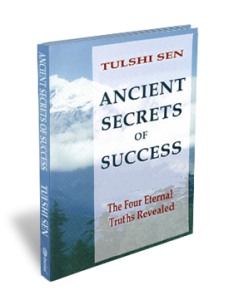 Ancient Secrets of Success reconnects you to your power. It has become my top reference book for my personal and business growth." 8. Why Can’t We Hold a Vision and Manifest the Vision?